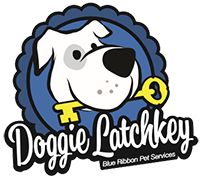 Doggie Latchkey is passionate about animals and dedicated to providing the highest level of in-home, board-certified training. We have contracted a specialist to provide this service, who is CPDT-KA Certified by the Certification Council for Professional Dog Trainers. She has been a canine personal trainer in the Pawsitive Start program at the Michigan Humane Society, as well as being a volunteer dog walker there since 2008. Our contracted dog trainer has volunteered at several rescues in SE Michigan and Northern Ohio. To become a Certified Professional Dog Trainer Knowledge Assessed (CPDT-KA), trainers must have 300 hours of trainer experience and provide recommendations from a veterinarian, a client and a colleague. In addition, they must pass an independent, psychometrically sound and science-based exam to demonstrate knowledge in instruction skills, among others. Our one-on-one training sessions are ideal for puppies and new dogs, but can be just as effective for older pets that have developed less-than-ideal habits. From simple daily tips and tricks to more advanced techniques, we will help you and your four-legged friend develop a stronger, healthier relationship! Communication – Let’s face it: Dogs can’t speak, and you have no idea what they are really saying when they bark. The first step in any training program is to learn about the body language of your dog and how to act/react to what they are saying nonverbally. Train the trainer – You’ve undoubtedly heard the phrase “It’s not the dog, I’s the trainer.” Dogs instinctively look for a “pack leader,” and we will show you how to train or retrain your best friend so they understand the pack environment. Sustainability – While it’s indeed cute when your dog begs for food or jumps up on visitors the first few times, it can quickly become an unwanted behavior. You will learn the tools to stop unwanted behavior and how to keep it from happening again. Growth – We love our animals dearly and want them to be a member of our families for as long as possible. We will help you gain the confidence as a trainer, and from there you can train your furry friends to do almost anything! • Advanced commands – the more “fun” things you can teach your pet, such as pressing the “easy button,” sneezing, combined commands for routines and ringing a doorbell when needing to potty—the sky is the limit! Typical training sessions are 90 minutes, and can be purchased individually or as part of a training program designed specially for our clients. During your initial meeting with the certified canine trainer, she will customize a training plan to address the needs of your canine companion. If you are interested in booking professional training sessions, please get in touch to give us the basic information we need to start the process. The one-hour initial training consultation with our professional dog trainer starts at only $59. Contact us to begin dog training today!